Site updates, watching TV, and living with fish | Tales From The Ipe! Ah, the weekend has finally arrived. I don’t know if anyone noticed, but I converted the April and May 2008 galleries. You know, I haven’t really heard from anyone about the redesign. If I stay up working on this site, and no one checks it anymore, does it really matter? Maybe I shooed everyone off after months of little activity or life. I know what would attract everyone back — Pictures of old men playing basketball with monkeys in dresses. Not just any types of monkeys, mind you. The skanky ones. Thank goodness for DVRs. Whenever one of us is feeding Lily, we’ll hit the Tivo and find something to watch with one hand while we use the other to hold the bottle upright for her. There’s nothing new to watch these days, so we’re recording new-to-us stuff, or shows we haven’t watched in a long while — Friends, The Practice, etc. I’ve been watching old reruns of Quantum Leap, various Star Trek series episodes, Stargate SG-1. 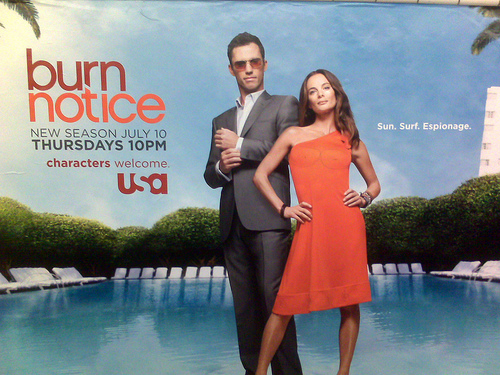 I’m personally looking forward the return of summer shows like Burn Notice and Stargate Atlantis. We’re thinking of getting an aquarium. My friend Doug got some deals on tanks, gravel, etc, from a pet store going out of business in his area. The big debate was freshwater vs. saltwater. I like saltwater fish, but I’ve been warned they’re very difficult to maintain. Freshwater fish are easier, but they aren’t too exciting. Hmmm, unless I get salmon. Or, seahorses. Lots of smart seahorses. Which have the ability to merge into Mega-Seahorse when the world is threatened by the evil…. geez, that would be the worst children’s animated tv show ever. The good news is that the audit is drawing to a close. I see the light at the end of the tunnel. BTW, I’m in Pennsylvania next week, but at least it’s a short week, being that Friday is July 4th. I’m also looking forward to our annual July 4th “Yo, we’re classy. Check out our classy picnic spread.” picnic. Burgers? Hot dogs? Puh-leaze. This is the one time a year we get hoity-toity with our…. picnic cuisine.